And since it is once again on my radar, I thought I would address the inaccuracies so I can then once again ignore it. Note: I actually tried to correct it many years ago – not knowing that editing your own wiki page is strictly prohibited – and was promptly booted off the site. So here it is in its most recent incarnation (2/29/16). …he attended Joe Kubert’s School of Cartoon and Graphic Art after a very brief career at a more traditional institution. Since when does going to school get referred to as “a very brief career”? What actually happened was that before attending the Joe Kubert School I tried out a number of other art schools that didn’t quite fit the bill as far as the career I was looking for. First off was a summer program at Atelier Lack in Minneapolis, which gave me a good grounding in the traditional methods of drawing. Next up was a brief stint at Atelier Hathaway (one of Richard Lack’s students), then a semester at the Minneapolis College of Art and Design. Keefe started his career coloring comic strips such as Blondie, Beetle Bailey and Hägar the Horrible. He was the head colorist in the King Features Syndicate comic art department. Keefe’s tenure lasted from January, 1996 to March 2003. Unfortunately he was unable to continue his work for King Features because of economic issues. Stilted sentence structure notwithstanding, I actually worked on staff at King from 1989-1998. 1996-2003 refers to when I wrote and drew Flash Gordon. And those “economic issues” were actually King Features’ economic issues – as they laid off my entire department as a cost cutting measure. 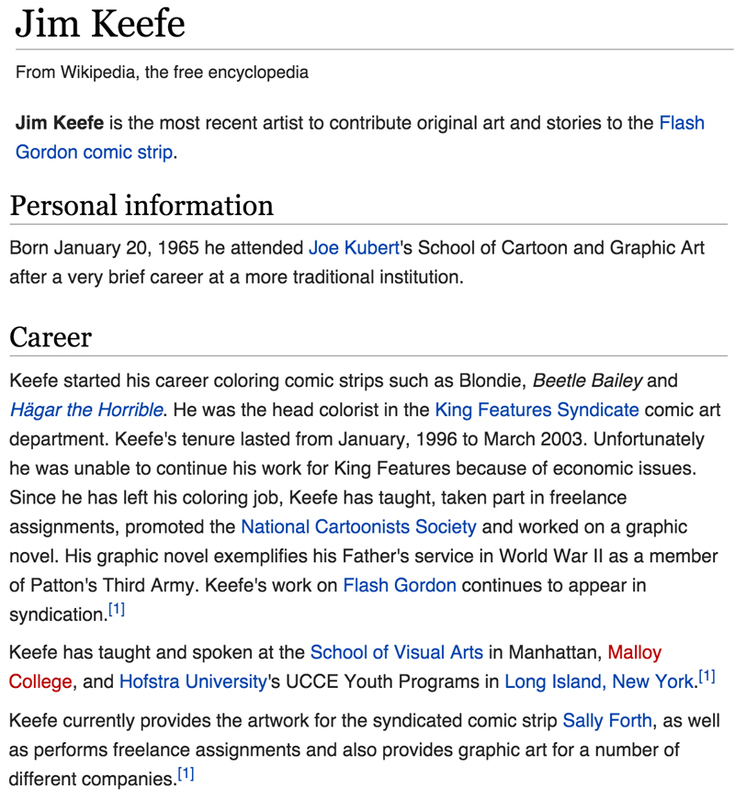 Since he has left his coloring job, Keefe has taught, taken part in freelance assignments, promoted the National Cartoonists Society and worked on a graphic novel. His graphic novel exemplifies his Father’s service in World War II as a member of Patton’s Third Army. Keefe’s work on Flash Gordon continues to appear in syndication. This reads like it was translated from japanese using Mac’s translation app. My name is Jim Keefe. And yes, I admit it – I have taken part in freelance assignments. And as for the Graphic Novel that I have not actually completed, may I suggest the word chronicles instead of exemplifies. Keefe has taught and spoken at the School of Visual Arts in Manhattan, Malloy College, and Hofstra University’s UCCE Youth Programs in Long Island, New York. Keefe has taught and spoken at, he has. Keefe currently provides the artwork for the syndicated comic strip Sally Forth, as well as performs freelance assignments and also provides graphic art for a number of different companies. Note: When I perform my freelance assignments, it’s usually an interpretive dance. 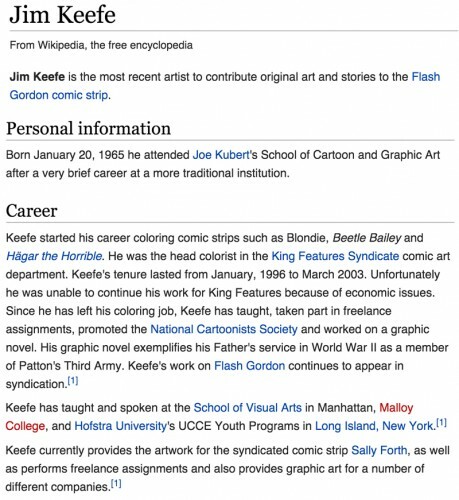 A graduate of the Joe Kubert School, Jim Keefe started his career as the head colorist in the King Features Syndicate comic art department, coloring such world-renowned strips as Blondie, Beetle Bailey and Hagar the Horrible. Teaching and speaking engagements include the School of Visual Arts in Manhattan, Malloy College and Hofstra’s UCCE Youth Programs in Long Island, New York – and most recently as an Adjunct Teacher at the Minneapolis College of Art and Design. My thanks for indulging me and letting me get this off my chest. Thanks to Genevieve Gendron-perso (from the Creative Focus Workshop offered by Jessica Abel) my wiki page has been corrected.